Every year when winter rolls around, I find myself lamenting the onset of cold weather while simultaneously celebrating the arrival of one extremely seasonal fruit: blood oranges. 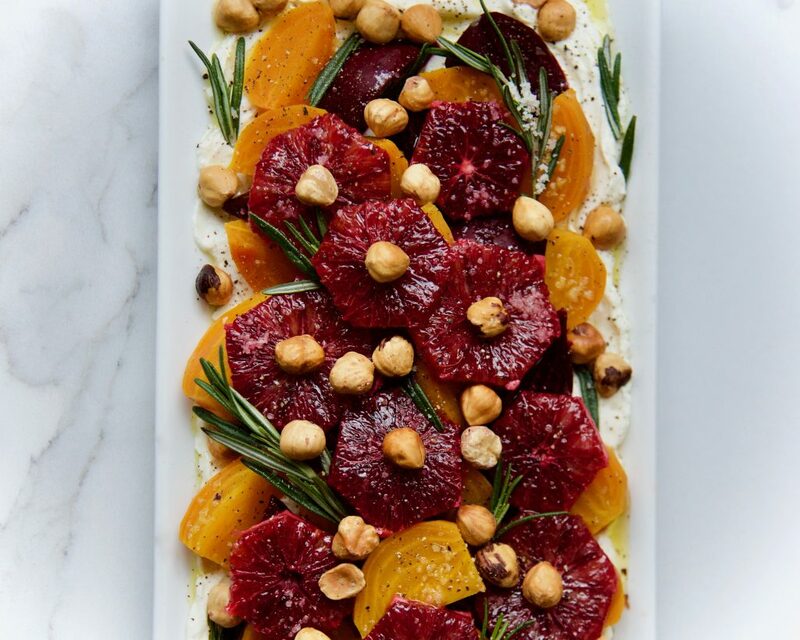 This healing hazelnut beetroot salad celebrates the flavors of the season, and frankly: it’s gorgeous! Composed salads make a beautiful addition to any holiday meal; this one will have guests talking and marveling over how simple and delicious it is. This salad is an easy dinner option whenever you want to treat yourself, but it also makes a delicious lunch item. Most importantly, it’s super nourishing for your body and mind. 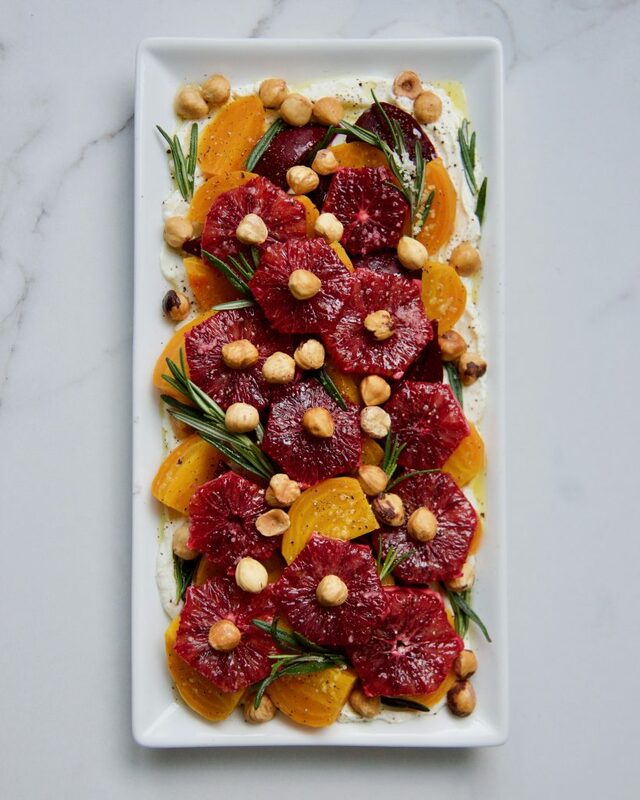 Blood oranges are a lovely winter staple, rich in anthocyanins that help fight free radicals and inflammation. (This specific antioxidant is only present in blood oranges, not regular oranges– this is the source of the fruit’s bright pinkish-reddish hue.) Because they require a specific, somewhat low temperature to ripen, blood oranges are harvested in the winter. Naturally occurring nitrates in beets can help stabilize blood pressure and improve blood flow to the brain. They’re also a rich source of folate– a water-soluble B vitamin that is thought to improve mood. Folate is currently being tested as a possible antidepressant, as depression is often linked with folate deficiency. Hazelnuts, meanwhile, are rich in folate, magnesium, calcium, and vitamin B6, which is a necessary vitamin for energy and brain health. Like folate, B6 helps regulate mood and ward off mental fatigue. Unheated olive oil is rich in brain-healthy omega-3 fatty acids, and the fat helps the body absorb other fat-soluble nutrients in the salad, like Vitamins A, D, K, and E.
Suffering from a pesky case of the winter blues? Power salad to the rescue! This colorful, impressive-looking composed salad is ideal comfort food during the dark winter months. It’s full of anti-inflammatory brain-boosters that help fight the three F’s: fatigue, free-radicals, and fog (brain fog, that is). Heat oven to 325 degrees. Toast hazelnuts in a glass pan for 15 to 20 minutes or until aromatic and slightly golden brown. Place beets in a large saucepan and cover with water. Add 2 tablespoons of vinegar to keep the beets from bleeding. Bring to a boil, then reduce heat and simmer for ~45 minutes to an hour or until fork tender. Allow to cool until just slightly warm, then rub the skins off under running water and cut into quarter sections. 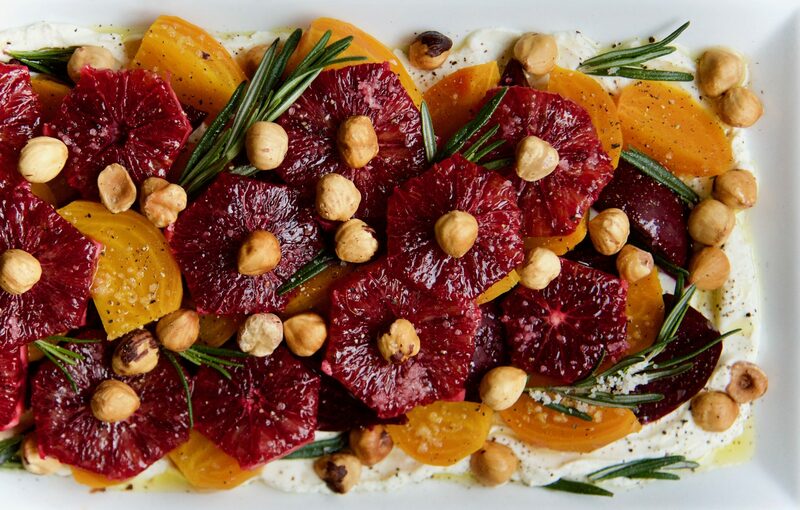 Create a base for the beet salad by spreading the labneh on a flat serving platter. Start by spooning the labneh onto the center of the plate and then use the back of the spoon to spread it out, creating a smooth edge– think of how moms spread JIF in peanut butter commercials. 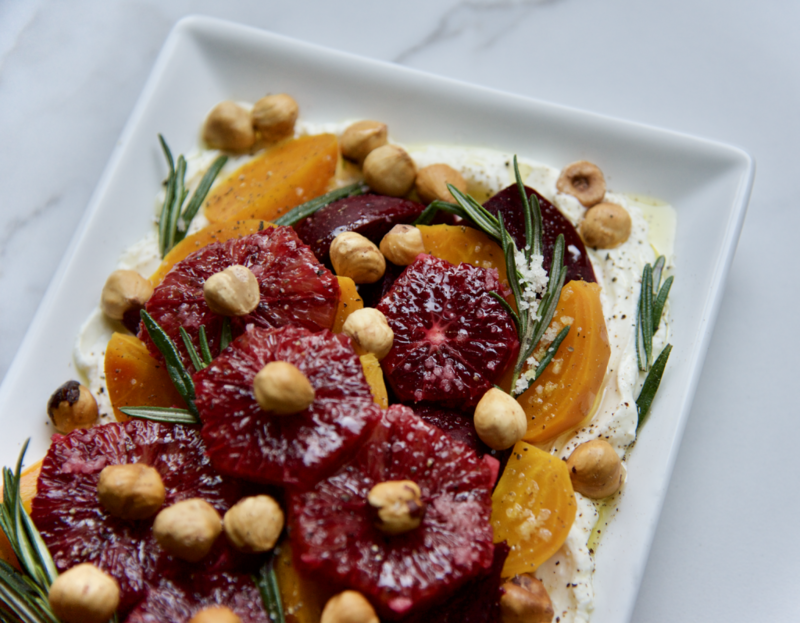 Place quartered beets on top of the labneh, then layer the citrus and hazelnuts on top of that. Drizzle generously with olive oil, garnish with rosemary, and sprinkle with salt and pepper, to taste. Enjoy! * If you can’t find labneh in your local supermarket, you can make your own by mixing 2 cups yogurt with 1-2 teaspoons of salt and straining through a cheesecloth overnight. Place cheese cloth on top of strainer and place the strainer in a bowl. Spoon yogurt-salt mixer on top of the cheese cloth and gather into a bundle. Seal with a twist tie and allow to strain in the fridge for at least 6-8 hours. Labneh will be ready to use when it is thick and smooth, e.g. the consistency of soft cream cheese or quark. ** Rosemary is just for garnishing. It will impart flavor in as little as 20 minutes, but should not be eaten as it will be bitter (but if you’re into that, go for it). In need of a gentle mood boost? These foods can help ease the Winter Blues. Or, you can make this Stress-Busting Turmeric Popcorn.